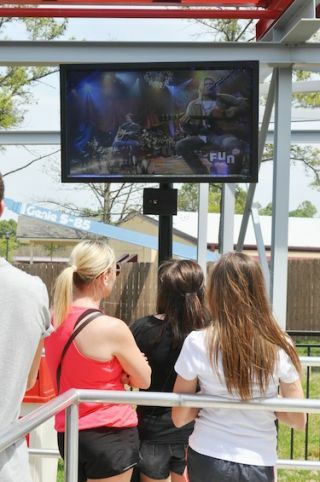 While roller coasters might be the main attractions at Cedar Fair Entertainment Company’s 11 major amusement parks, SunBriteTV’s outdoor-rated displays help keep guests entertained at the parks year-round. In an aggressive deployment timeframe of just eight rainy weeks, SunBriteTV’s outdoor televisions were chosen for their ease of installation and weatherproofing technology that has withstood the elements across North America. They proved versatile and reliable tools in delivering necessary information and entertainment to Cedar Fair’s 23 million annual guests. The ReflectView enterprise digital media software suite provides Cedar Fair control over the management, distribution and presentation of HD media content and applications. ReflectView provides Cedar Fair with a flexible platform to display dynamic messaging and media that effectively communicate promotions and park attractions, and it supports the integration and management of open standards for content, apps, and web technologies. The project came about in early 2014 when Cedar Fair tasked Reflect with enhancing the customer experience. This meant finding a solution to provide information and entertainment quickly and dynamically over digital networks. SunBrite TV provided weatherproofing technology, ease of installation, and product versatility.